The left and right moving mechanism of the BC-2 slitter unit is our unique method that used the endless steel belt and clutch to resist the paper powder clogging. After moving, the position will be measured by an absolute position sensor which used the ultrasound and magnetism. And be fine-tuned to the specified position automatically. This method is proud of the high position accuracy. 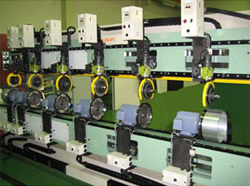 The BC-2 slitter unit has a structure which not only can operate by automatically, but also can operate by manually. And mode changing can be performed by the switch button in the operation box. 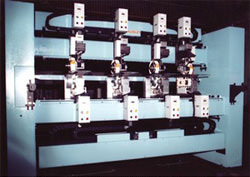 The slitter unit can be operated easily by a finger in the manual operation. This structure is a proprietary technology of MAYSUN, and it is effective at maintenance such as rebladings. If you switch from a manual operation to an automatic operation, the slitter unit can be returned to the specified position by the absolute position sensor. In addition, because the slitter unit uses an AC servo motor, the moving speed is optional. The BC-2 slitter unit has a built-in contact pressure sensor of the strain gauge type, which be developed the first by MAYSUN in the world. By the sensor, the contact pressure of the slitter blade will be digitally displayed, and the tool-setting can be adjusted easily, too. Thereby, the steady slit section will be got frequently. The operation of the BC-2 can be performed by the touch panel screen incorporated in the operation panel. There`s a simple menu in the screen, so the beginners also can operate easily without discomfort. We would like to respond to customer`s specifications such as a slitting-width, slitting-pieces, etc.